What is usually identified as S. subulata is a popular aquarium plant which is currently cultivated by most major nurseries including Oriental Aquariums, Tropica, and Florida Aquatic Nurseries. 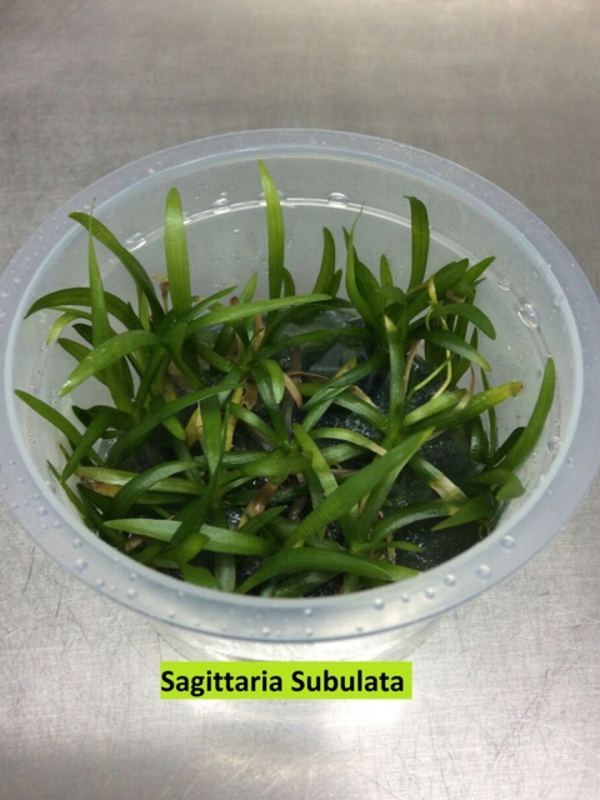 It is commonly available in well-stocked stores listed as &apos;Dwarf Sagittaria&apos;. S. subulata as applied to the plant commonly grown in the hobby is suspect, and most likely applies to a related species of swampy habitats in the Southern United States and perhaps farther south, as opposed to the tiny plant of fresh and brackish tidal mudflats in the Northeastern United States. In the recent past, the concept of S. subulata as a species was much broader and likely included both plants. The true identity and current name of the commonly cultivated species remains to be determined. "S. subulata" is a fairly easy plant to grow, requiring only moderate light. 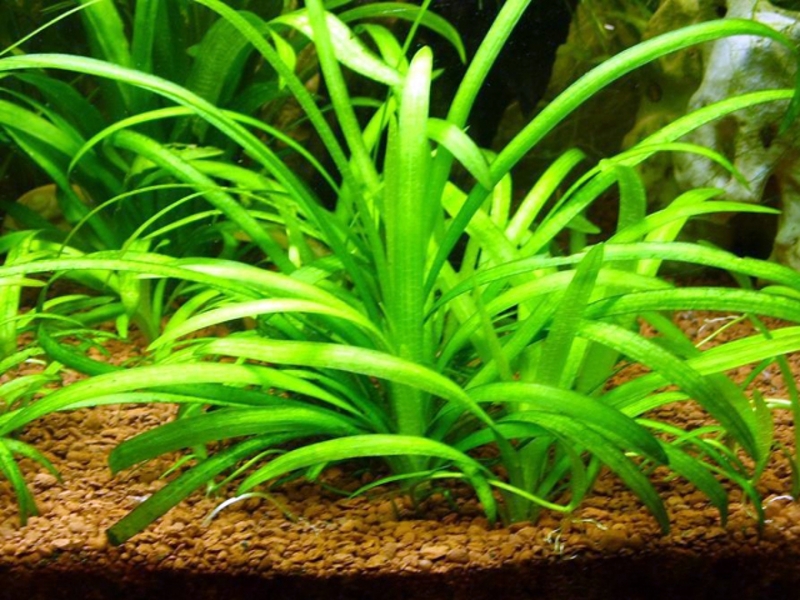 This plant species can tolerate quite hard, alkaline water conditions. Also, this plant species does well in non-CO2 aquaria, although CO2 injection does greatly enhance growth. Either a rich substrate or rich water column with ample amounts of phosphate, nitrate, potassium, and iron/micronutrients will produce the best results. This plant is especially finicky about iron levels and will show deficiencies with yellowing leaves. Intense lighting will bring out reddish leaf apexes. 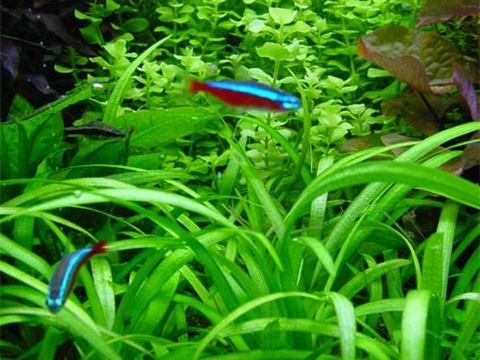 Planted densely, the 0.5cm wide leaves have the ability to grow to 60cm. Less dense plantings keeps the leaves short, in the 5-10cm range. "S. subulata" is a fast grower, and as it propagates by runners, it can quickly form a dense carpet. Sometimes, this plant will send long flower stems to the surface which bear small white flowers. The relatively short height of this plant makes "S. subulata" ideal for foreground or midground locations or in dense plantings. This grassy textured plant can also be accented with other plant species such as Anubias barteri var. nana and Glossostigma elatinoides for contrast and a more natural appearance. If allowed to grow up to 60cm, then it can be used in the background to create vertical strokes in a layout.